Welcome to the second issue of the IRF (Geneva) Newsletter for 2018. 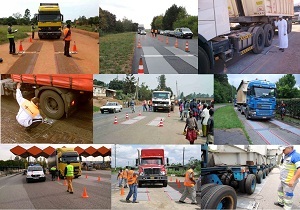 We have witnessed some interesting developments over the past two months especially in the road safety arena. A UN Road Safety Trust Fund was launched in New York in April and we are all gearing up in the sector to support in different ways this collective effort and ensure that road safety becomes a reality for all. Whether it is to support the road safety cause or to ensure better planning and management of transport infrastructure and expenditure, the issue of data and good collection and management of data is definitively at the centre of the attention. We as IRF are proud to give our contribution to the sector by continuing and improving every year our work on the IRF World Road Statistics (WRS) published now since 54 years. Data were also central in the discussion had in Athens last week during the SaferAfrica project meeting and Management Board. We need to scale up action in Africa and quickly and reliable data are needed to design and implement evidence-based interventions and most of it, to measure their impact. Over the next weeks, IRF will be sharing its views, input and work in Leipzig during the annual International Transport Forum (ITF), in Australia during the RA and IRF Regional Conference and in China for the World Transport Convention. 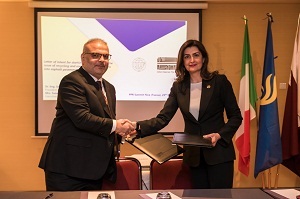 The Pavement Preservation and Recycling Summit (PPRS) 2018 in Nice (26 - 28 March 2018) set the scene for the signature of an important MoU between Ashghal, the Qatari Public Works Authority and the International Road Federation (Geneva). 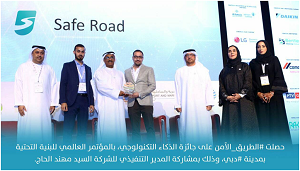 Ashghal's participation in the summit was part of its endeavour to open opportunities for cooperation and investment in the road sector and recycling of construction materials. 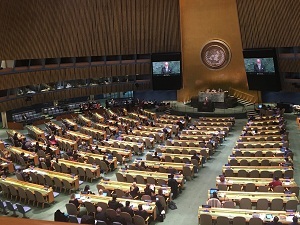 The Road Safety community gathered in New York on 12-13 April for the launch of a new United Nations Road Safety Trust Fund. 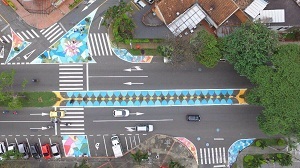 The new UN Fund is intended to catalyse road safety action across the globe, using donations to help unlock new government and municipal funding and re-focus national road safety budgets towards proven 'Safe System' interventions. Applications for the Evonik Road Safety Award 2018 are now open! IRF (Geneva) is pleased to support for the third year the Evonik Road Safety Award. Granted every year, the Evonik Road Safety Award acknowledges and rewards the contributions to road safety of public authorities worldwide. Programme for the 2nd RA-IRF Asia and Australasia Regional Conference is now available! Join the IRF Young Professionals Programme! The IRF Young Professionals (IRF YP) is a platform for the next generation of leaders and specialists in the road and mobility sector to propose initiatives, share ideas and be engaged in the overall activities of IRF. IRF-YP gathers proactive graduate students enrolled in a Master or Ph.D. programme as well as young professionals working in the sector. Building on the IRF's vast network and expertise, the Programme has as its mission to present the road and mobility sectors as a multidisciplinary area for development for young professionals from various backgrounds. After two initial years of work culminated in the interactive workshops hosted during the World Meeting, our IRF YP are ready to change gear and embrace new challenges. 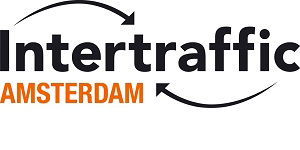 Intertraffic held in Amsterdam on 20-23 March 2018 offered once again a great opportunity to connect and to share knowledge. IRF (Geneva) hosted during this edition three successful workshops in collaboration respectively with Swarco, Evonik and PTV. Integrated mobility management, sustainable and safe urban street design and traffic management for developing countries were at the rendezvous. The proceedings of the three workshops are now available on IRF website. CCCC Highway Consultants Co., Ltd is one of subsidiaries of China Communication Construction Company Limited. With more than 60 years of history and rich experience, the company is in a leading position in China and also one of world-renowned consulting companies in the world in terms of master planning, design, and construction management of highway, bridge, tunnel, rail and municipal works. The company ranks the 15th in ENR Top 60 in 2017. The Global Alliance of NGOs for Road Safety is an umbrella organization that represents over 200 NGOs active in road safety in more than 90 countries. The Alliance was founded in response to demand from NGOs worldwide for a forum where NGOs can share best practices and collectively advocate for road safety and the rights of victims of road traffic injury. The Alliance connects the worlds road safety NGOs, share best practices, coordinate global advocacy efforts and build NGOs capacity. HAENNI Instruments: Weight the loads and save the roads! Although most government authorities are aware of the importance to keep it in good conditions, many of them fail on this matter. The most common reason is the lack of resources to do maintenance and repair the roads. What they don't know is that it is much cheaper to prevent than cure. Founded as a division of Swarovski 60 years ago, SWAREFLEX produces robust and long-lasting reflectors with retroreflective glass elements (SWARO GLASS REFLECTIVES) for a wide range of applications. SWAREFLEX also develops innovative, bespoke solutions for light-guiding glass optics (SWARO LENSES) that combine precision and quality. Furthermore, SWAREFLEX produces intelligent active guidance and lighting systems. The long-standing expertise and excellent quality in the production of technical glass from Swarovski form the basis for the outstanding product and service portfolio of SWAREFLEX which enables the company to continuously pursue its goal: to protect lives. To learn more about the company and explore the full range of products and solutions, visit the newly launched website www.swareflex.com, where you can also download the latest Reflectors Catalogue. HAENNI Instruments Inc. is a leading supplier of mobile wheel load scales for police weight control. Its mission is to provide the best solution for the mobile weight enforcement and to contribute for a better and safer worldwide road network by decreasing the overload and increasing the safety, the competition fairness and protecting the high investments done on the roads construction. The unique and patented measurement systems give the HAENNI wheel load scales unmatched accuracy and acceptance in the world market place. OIML certified and known as the thinnest on the market, HAENNI scales are light, robust and they live long. The variety of types, sizes and ranges enables their use in different applications. Besides the weight enforcement they are also used at the private industry, universities, test laboratories and departments of transportation. 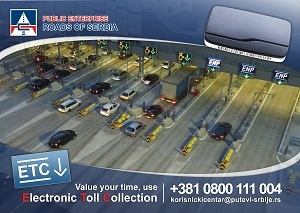 International Conference on Road safety: a responsibility of the company? Take advantage of a whole range of services including special rates for the IRF World Road Statistics (2017), other IRF publications and preferential registration rates for upcoming IRF events! © Copyright International Road Federation 2018. All rights reserved.